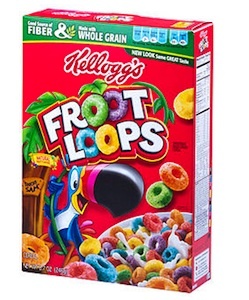 On Checkout 51’s list this week (Sept 12-18, 2013) is Kellogg’s Froot Loops Cereal, 275g or 345g box. The taste, the colour, the fruity aroma. Follow your nose to this breakfast cereal that’s made with corn, wheat, whole grain oat flour and natural fruit flavouring. You will get $1.00 cashback rebate at Checkout 51. Here’s a pic of what it looks like. I found a couple prices of it at a few stores. I didn’t find any Kellogg’s Froot Loops Cereal coupons to use.